As most of you know, Noomii offers a fantastic (optional) program to its paid members, called the Coaching Circle - a system that allows you to get coaching from a Noomii member coach in exchange for coaching a different member coach. Which gives coaches on our network the chance to receive the benefits of coaching at no cost other than your time. However, unless both parties involved in each engagement are fully present, respectful and accountable, it doesn’t work as well. On that note, we wanted to put together a post on the importance of fully engaging in your Coaching Circle sessions, as a friendly reminder to everyone who is taking part in the program or is interested in joining. Say you get matched with someone that you automatically know is not going to be a good fit for you, whether you have spoken with them yet or not, so you decide not to go ahead with the engagement. That is completely fine - we aren’t all compatible, after all and you are entitled to receive a new match from us. All you have to do is let us know and we will happily get you back on the list and matched with someone else. In fact, by ending the engagement, you are automatically re-added to the pot of coaches in need of matches. However, when you end the engagement, it doesn't tell the other person your reason for doing so. Therefore, it is common courtesy to also let your match know that it’s not a good fit by sending them a quick message saying so. Leaving the other coach wondering and waiting not only conveys a lack of professionalism, it is just not nice. If you don’t want to work with someone, let them know, so they can be matched with someone who does. When you request to join the Coaching Circle, you are given the chance to write a blurb about the kind of coach and client you are looking for. This is a great way to help us match you with a suitable coach and client, but sometimes if the request is too specific, it can be difficult to find a match. At any given time we have a limited number of coaches available for matching (between 8-12) and because we don’t want to leave coaches waiting too long to be matched, it’s important to have realistic expectations in regards to your request. Of course, this doesn’t mean you have to take whatever you can get - just be mindful of this when making your request. The main reason for the Coaching Circle is to create a co-active coaching experience where coaches are supported in their goals, held accountable, encouraged and challenged to stretch and grow, not to gain a business or marketing consultant for your coaching business. You wouldn’t ditch out on a client session or flake out on them at the last minute, so why would you do it to your Coaching Circle client? If you choose to be a part of the Coaching Circle, you have to treat this person like any other client. That means keeping your scheduled appointments with them, showing up on time and being fully engaged in each session. Of course, we all have unexpected emergencies and that is totally fine and part of life. However, it is easy enough to send a quick email or text letting someone know that a serious matter that needs your immediate attention has come up - which brings me to my next point. Running a coaching business can get busy! We are all familiar with having too much on our plate and sometimes this can mean certain priorities get left by the wayside. That is part of life and completely understandable. Still, as a professional coach, you know that you can’t simply drop out of scheduled appointments - it makes you look, well, less professional. Again, you want to take this coaching engagement just as seriously as you would a paying client. If you have an appointment scheduled with your coach or client, keep it. If you absolutely cannot make it, then give them advanced notice and offer some options for another suitable time you can reschedule it for. 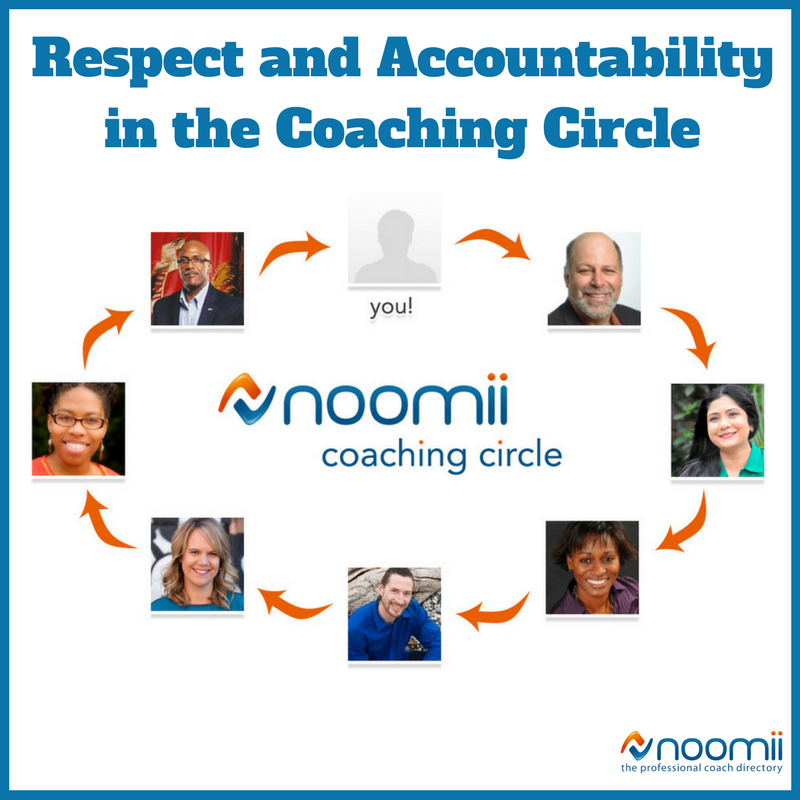 When you sign up for Noomii, you aren’t obligated to join the Coaching Circle, it is simply an added bonus to those who want to give and receive coaching (and gain ICF credentials). If you have a busy schedule and don’t think you can commit to it, that is totally fine. The same goes for those who have been involved in the Coaching Circle, but suddenly find their schedule getting packed up with other engagements. If you can no longer commit, all you have to do is let your Coaching Circle coach and client know, end the engagement and then pause your enrolment. To pause your enrolment, just simply sign into your Noomii account, visit the Dashboard, click on the Coaching Circle and hit the “Pause” button.